Check out this full tang, extra large, satin finished tanto! 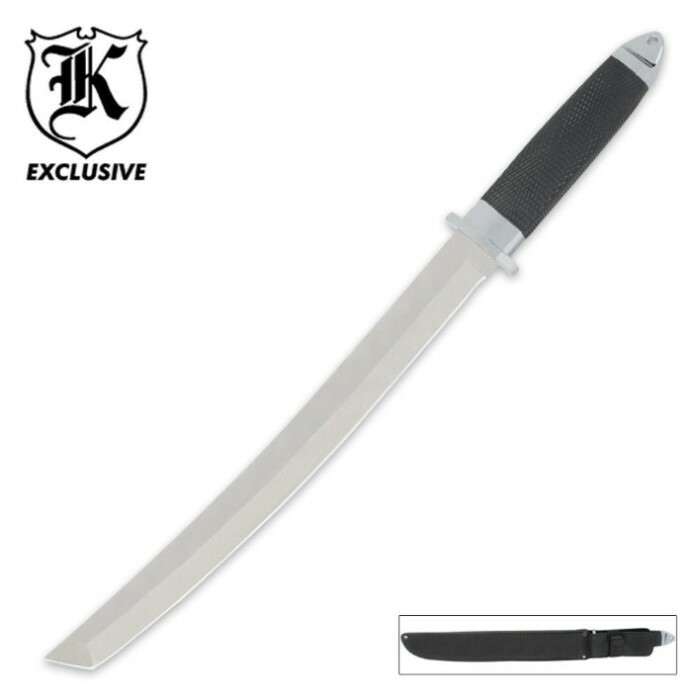 The stainless steel blade stretches from one end to the next of this traditional tanto. The handle offers an impact resistant ABS, checker board grip for ultimate control, and cast metal bolsters. Includes a nylon sheath. 17 in. overall. For the price - well worth it with some work. This steel is HARD! I have changed the blade angle, Broke it over last night and started a course shave edge. I do not mind and do as habit, retool my bought blades. I am actually proud of this steel have been working it for a few weeks on and off. If you drop this knife and do not get your feet away - you better call an ambulance! I first bought this very same knife 10 years ago from a street vendor in Thailand, it was a weird situation, and I bought 2 of them, less than an hour later they had saved my life. Since then I have wanted to find them again, and finally so long after,here in America I found them, (oddly the same price as from the street vendor 10 years ago in Thailand, converting Thai baht to dollars) And I again bought 2, what else can I say these knives saved my life in a bad spot, discarded soon after use so I don't know how well they will last, but for a fast life or death situation they will keep u alive, end of the day that is really what it's all about. Love these knives. Ordered this through one of the BOGO sales and I am very pleased with the product. It arrived promptly, despite weather conditions, at my front door in exactly a week. The packaging was straightforward and I knew exactly what I was getting into. I was surprised that the blade was so sharp coming right out of the sheath. After a little honing it was razor sharp. I will definitely be picking up a pair of these again if they ever end up on the BOGO sales. They make a great gift. My step father was so enthused he put it up on display in his den immediately! Thanks BUDK! It's not the cold steel magnum tanto. But it's about the same length, and if all you intend to stab with it is someone's skull, and not a car door, it should do just fine. It did not come out of the box very sharp, and it is thin enough that it may break if subjected to enough sheer force. I wouldn't call it exactly thin, but again: this is not the cold steel magnum tanto. But if you get attacked by a bear, h**l even a polar bear, I think a knife this long could make it very dead. Also the sheath is not very good. I modified it with some gorilla tape.